Gibson Les Paul Standard Model Solid Body Electric Guitar (1969), made in Kalamazoo, Michigan, serial # 541900, natural re- finish, mahogany body with maple cap; mahogany neck with rosewood fingerboard, gig bag case. OK, you say you want Relic? Well, Hoo-boy as the old Marvel comics expression goes, do we have a relic for you. There's definitely a story here-or maybe several stories, and a heaping helping of New York Street Survivor vibe. This has been a one-owner guitar since the summer of 1974, but it already went through quite a few changes before that time. 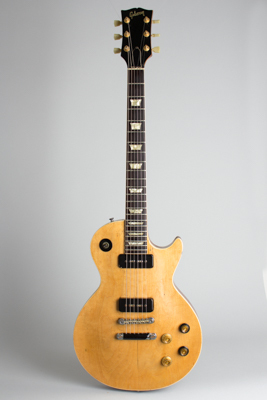 This started out life as a fairly early 1969 Les Paul Standard, with a gold top finish and two cream P-90 pickups. It retains nearly all of the more desirable features of this rapid transitional period for the newly-re introduced model, which was a very different creation by the end of that year. This litany includes a one-piece mahogany neck with no volute or "Made in USA" stamp on the headstock and long neck tenon anchoring it inside the body cavity. The body itself is the single piece mahogany with a maple cap construction replaced with a multi-piece "sandwich" around the summer of '69. The notable newer features on this particular guitar are the larger profile headstock introduced in late 1968 and the wider binding inside the cutaway. Not long after being originally purchased, this guitar's body was stripped of its finish and painted black…ALL black, including things not usually finished over like the pickup covers, tailpiece and switch. Even the two lower knobs were pinstriped. It then accumulated a lot of wear, so when it was sold in 1974 the new owner stripped it again and added a rather amateurish clear overcoat to the now-bare wood. A few small traces of the original gold, and second black coat can still be seen. The neck was never stripped, but had a more professional clear lacquer overspray added that somewhat obscured the serial number, causing someone to go in and re-etch the numbers by hand. And then it was played extensively some more, accumulating more wear. Hey, we said "Relic" already! Considering this history, it is kind of amazing how much remains original. The pickups are still the original P-90's, under their black-painted cream covers (there's a bit of cream plastic peeking out on one corner where the paint is wearing off). The pickup wires have been splices (during a refinish) but the wiring rig itself is still original with pots dated the 52nd week of 1968 and the original large capacitors. Most of the other hardware is original as well including the bridge, tailpiece (still mostly painted black), switch and ring (ditto), strap buttons and knobs (all missing the metal caps, with the lower two still having black-painted skirts). The pickguard is long gone, and the jackplate is of course replaced. There have been several sets of tuners on and off over the years; currently mounted are gold plated "Gibson Deluxe" units with single-ring buttons. Also kind of amazing, the headstock has NEVER been broken or even cracked. The shadow of "Les Paul Model" is still visible on the face. The frets appear to still be original, crowned very flat with the old '70's feel of jumbo wire taken down more than once. We're told this guitar has spent the last 30 years or so as a recording instrument, and has been used by many players in a commercial studio. Whatever you may think of its looks, the sound of this guitar is spectacular, rich, meaty and still cutting in that much-beloved vintage Les Paul way. Stripped, worn, battered, and still a killer guitar with a real heavy '70's vibe. The look is very reminiscent of the stripped Les Pauls played by Ronson, Bolan et. al. before old Gibsons were "collectibles" and were just the hard-rocking player's choice. This guitar could be refinished and restored without too much difficulty to more original condition if desired, but we kind of love it just the way it is. Overall length is 39 7/16 in. (100.2 cm. ), 13 in. (33 cm.) wide at lower bout, and 1 15/16 in. (4.9 cm.) in depth, measured at side of rim. Scale length is 24 3/4 in. (629 mm.). Width of nut is 1 11/16 in. (43 mm.). The somewhat uneven non-professional finish on the body shows numerous dings, scratches and worn-away spots, with a few deeper gouges thrown in on the back and sides. The top center seam is darkened with wear from having opened just slightly, and there is a tiny visible split behind the bass tone knob, not going anywhere. There are a couple of dings through the finish on the back of the neck and the frets are flat-crowned but playable. The beauty in this one rests IN the wear, not despite it…approach with the right vibe and this NY Street Rat will send you spinning back down the vortex to Max's in 1973 and CB's in 1977-Marshall 50 not included! Very Good Condition.